The distance from the Avalon Gardens public housing development in South Central Los Angeles to elite Smith College in western Massachusetts should be measured in more than the 2,900 miles separating them. The housing project near Watts is a cluster of nearly identical pale orange one- and two-story buildings surrounded by a high metal gate installed to keep gangs out. It is home to about 440 low-income, mainly Latino and black, residents whose scramble for economic survival is eased by subsidized rents. In contrast, Smith College, a women’s school where costs per student can top $69,000 a year, is one of the most beautiful campuses in the nation, dotted with Victorian architecture and its own pond. While Smith has enrolled a more diverse student body in recent years, its alumnae include such well-known and affluent figures as feminist icon Gloria Steinem, the late former First Lady Nancy Reagan and influential chef Julia Child. Journeying from one to the other and back again is not easy. But Maria Perez did it, growing up in Avalon Gardens through high school and earning her bachelor’s degree at Smith last year. And now she is helping other youngsters in Los Angeles’ public housing make their own academic journeys, not necessarily to Smith but at least to a California State University or University of California campus. A community college nearby would be fine, too. Maria Perez grew up in public housing and returned as a college counselor there now. Students who live there often don’t receive enough guidance at high schools and their parents know little about SAT exams and scholarships, the program’s designers say. The goal is to bring personal attention, just a few doors from home, to youngsters who often are the first in their families to attempt college. “If we are able to plant a small seed and get them to start thinking about college, then we’ve made a difference,” Perez said. Her mother still lives in Avalon Gardens, just across a lawn from the computer lab where Perez and a co-worker meet young people. Encouraging signs inside the Project SOAR office at Avalon Gardens. The program is known as Project SOAR, an acronym for the ambitious title “Students + Opportunities + Achievement = Results.” It has operated as a pilot for about six months in nine U.S. cities, including Chicago, Phoenix and Seattle, under a $2.5 million grant for two years from the U.S. Department of Housing and Urban Development (HUD). 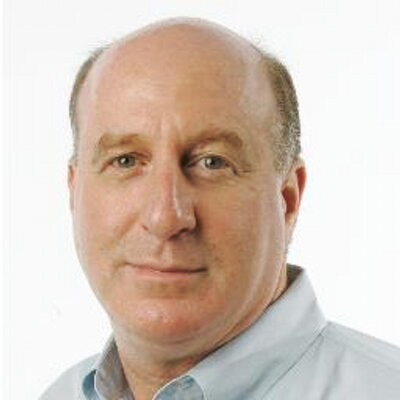 In Los Angeles, the only California location chosen, the public housing authority was given $452,000 and contracted with the Southern California College Access Network (SoCal CAN), a consortium of nonprofit college prep agencies, to station counselors in five local housing developments. Will it make a difference? That remains to be seen — given all the challenges of poverty and history. If success is proven in an upcoming study — and if funding is authorized — the program might be expanded across the nation. The potential audience is huge, since about 194,000 teens, age 15 to 20, live in public housing across the country, including 9,400 in California, according to HUD. Some housing projects are shaking off old reputations as the kind of places more likely to launch young men to jail rather than to UCLA. In fact, as a kind of silent reminder, one of the project’s Los Angeles locations, the William Mead Homes, is just across railroad tracks from county jail facilities in downtown. Murals near the William Mead Homes in Los Angeles depict life’s possible alternatives. Residents and officials say that gang violence has eased in recent years, allowing the many law-abiding tenants to feel comfortable with their children taking part in an after-school program on the grounds. 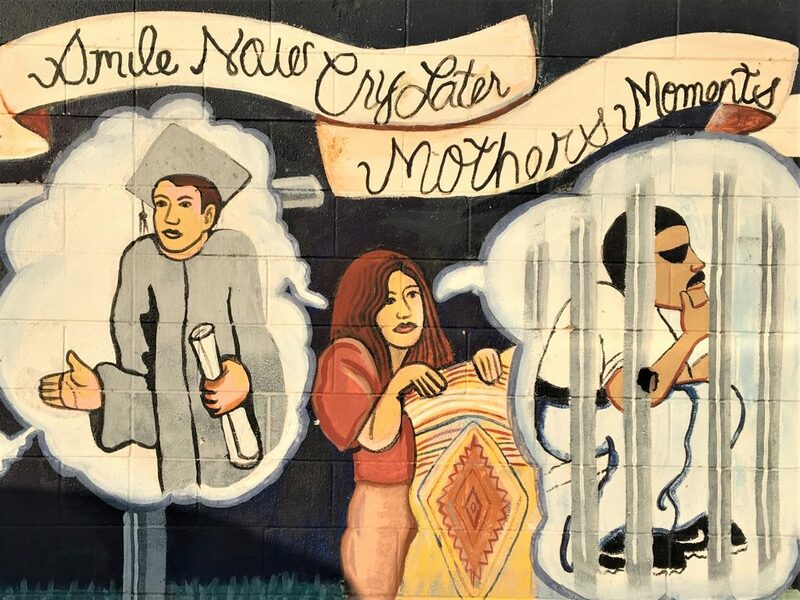 Still, some resistance to Project SOAR persists, including fears among undocumented parents about participating. Stephanie Sanchez, a senior at King/Drew Magnet High School of Medicine and Science and a resident of the Gonzaque Village development in Watts, joined early on. Her father is a day construction laborer with bouts of unemployment and her mother stays at home with five younger children, so Stephanie needs ample financial aid to pursue her goal of studying kinesiology or biology. 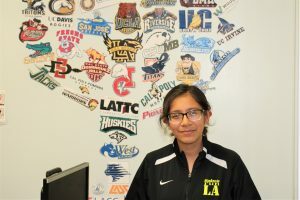 She already has been accepted at several Cal State campuses and UC Merced. Stephanie Sanchez received college guidance aimed at public housing residents like her. In reaching out to students early in high school and involving parents, the program aims to “instill a college going culture on the housing sites” and to “demystify” the process, said Alison De Lucca, SoCal CAN’s executive director. 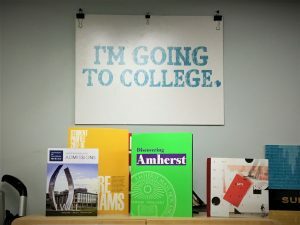 Too many students in the past were “not getting the messages from their high schools.” And many parents just don’t know what it takes to apply to college, she said. So far about 75 students have joined at the five Los Angeles locations and the program’s leaders hope to eventually recruit at least 250 of the 900 or so eligible young people, ages 15 to 20, who live in those developments. Counseling and tutoring are offered two afternoons and evening a week at each site. As part of a national experiment, their track record in completing financial aid applications, receiving aid, getting acceptance to colleges and actually attending will be compared in two years to that of other public housing residents who did not receive the guidance. That research in Los Angeles and the other eight cities will be used in Washington, D.C., debate over whether to expand or end the program. Beyond statistics, the program faces political uncertainty in the Trump era since it was formed at the end of the Obama administration. While it is too soon to tout results, early signs across the country “are promising” in recruitment and getting federal financial aid documents filed, according to Maria-Lana Queen, who is HUD’s Project SOAR manager nationwide. Access to high-speed internet for college searches and applications is attracting some families who can’t afford online services, she said. Challenges remain, such as reluctance among some parents to release personal financial information, she added. 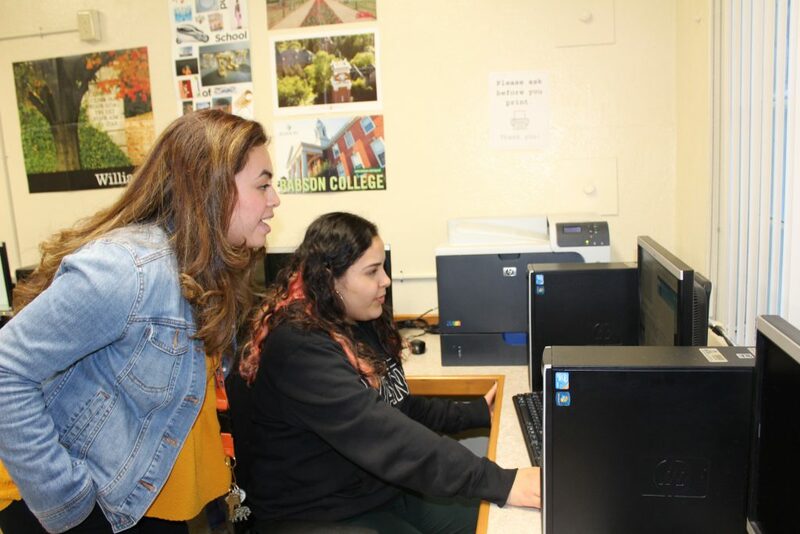 Stephanie Guzman, a counselor in Project SOAR, helps high school senior and public housing resident Diana Garcia with college applications. Economic barriers are steep for many public housing residents in Los Angeles. The families — 97 percent of them are Latino or black — have an average household income of $21,634, well below half that of the surrounding city and nation, according to the city housing agency. At Avalon Gardens, just 45 percent of the households have at least one member who is employed. That is partly offset by rents that are often figured to be 30 percent of income and average about $400 a month. At Avalon Gardens, visitors may see no signs of gang activity but “No Trespassing” signs loom large. Gang influence used to be a lot stronger when Perez was a youngster, she said as she strolled into the computer lab. Inside, college banners beckoned to nearby Los Angeles Trade-Tech College and distant Vassar College in New York, among many other schools. Perez said she received assistance during high school from an organization that helped bright, low-income students land scholarships at elite colleges. She said she never felt poor growing up until she was “shocked” to realize how wealthy many Smith classmates were. That eased as she made friends and came to love the education at Smith, where she majored in history. Still, she always was “proud of where I grew up” and was happy to return home for vacations and now for work. She urges residents there not to be afraid of applying to private colleges like Smith since they may award enough financial aid to make costs lower than at a UC or Cal State. Navigators, she said, have to coax students to write application essays about obstacles they faced. “Students who live in public housing generally have trouble answering that because of how humble they are. To them, this is their daily life, their normal life. They don’t view it as overcoming an obstacle. They don’t know how impressive their story is,” said Perez, who is considering a future career in law. 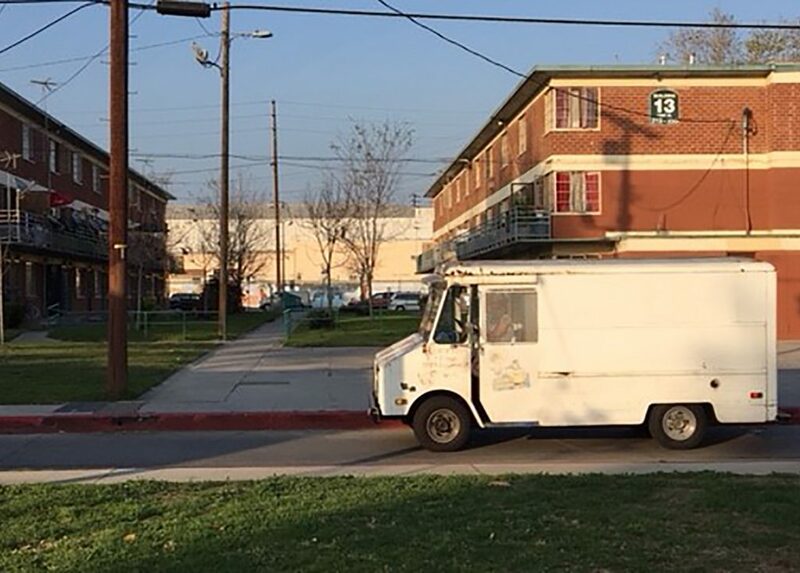 An ice cream truck visits public housing near Chinatown in L.A.
Across the city from Avalon Gardens, just on the border of Chinatown, the William Mead Houses were built in the 1940s as garden apartments in an otherwise industrial zone. lts 415 units in two-and three-story structures are home to about 1,200 residents, shielded from the skyrocketing rents that are pushing low-income families out of adjacent neighborhoods. That’s true for Diana Garcia, 17, a senior at Ramon C. Cortines School of Visual and Performing Arts. She said that her school’s counselors are helpful but Project SOAR’s navigators give her one-on-one attention and understand what it means to be from the projects. In an application essay, she described having to duck from bullets at a nearby bus stop. Parents say they appreciate the help. I hope these housing developments are not Low Income Housing Tax Credit (LIHTC) properties, as these tenants will just be evicted based on their full-time student status, without any regard to their financial situation, the fact that they are the cause of their homelessness, or their goals to get out of the housing developments by going to school in the first place. Thank you for covering this important story. Your readers might want to know that there are many housing authorities in the US working hard to bring educational opportunities to their residents, and a small handful working on cradle to career programs housed on housing authority campuses. Results are very encouraging. Thanks for sharing! I know of a girl that would qualify for this program, and she wants to stay in Bakersfield area, and go to Bakersfield College, or Cal State Bakersfield University! !